On mornings like this, I wish I had a fireplace before which I could curl up and just read, my latest book club book (as-yet unchosen, since it will be my pick this time round), one of the fifty or so I have stacked up in my office, the entire newspaper, magazines, or food mags. But, hey, wait a second! I do have a fireplace (albeit gas–ugh), one of the nicer features of this house. Unfortunately, it’s still surrounded by boxes and as-yet unassembled bookcases and other detritus that we haven’t found a place for yet. 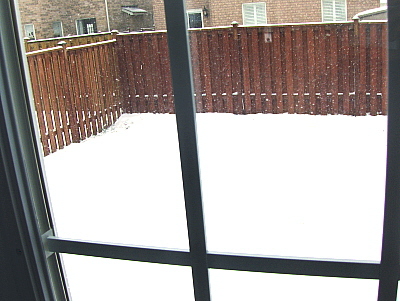 But something about the snow and the cold, as we all know, elicits a strong desire for comfort foods. As if I don’t have enough cravings for chocolate, anyway. 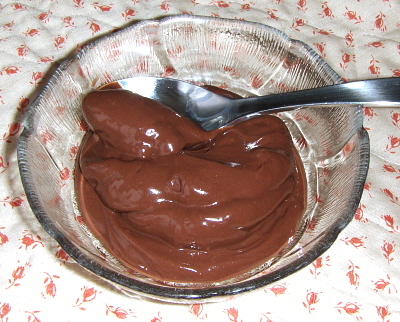 In order to satisfy the urge and eat something relatively healthy, I decided to mix up my favorite vegan chocolate pudding. Now, admittedly, there are at least 7,482 such recipes floating on the Internet and in various vegan cookbooks, but I still think mine is best. 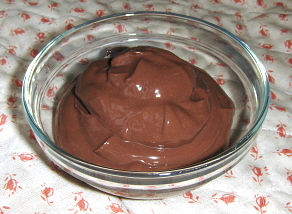 It’s an amalgam of recipes I’ve read over the years for similar puddings, from the McDougall‘s original to the ubiquitous vegan chocolate mousse one finds everywhere. This one is ultra-rich tasting, creamy and has a certain globby texture that reminds me exactly of old-fashioned, cooked, chocolate pudding. Only this one is made with relatively low-fat silken tofu (the kind in the aseptic boxes), cocoa powder (lower fat than actual chocolate), and agave nectar instead of any refined sugar. Chocolate bliss, truly. One caveat: my photos do not do justice to this extraordinary dessert. (In fact, the H.H. thinks it looks sort of like poo. “Poo? Did you say, ‘Poo,’ Mum? But I love to eat poo!”). Seriously, you have to try it. Even the highly carnivorous H.H. loves it (despite its scatological appearance). Open the tofu and drain any excess liquid. Break into large pieces in a food processor. Process about 30 seconds to blend the tofu, scraping down sides of processor. Measure the cocoa and agave nectar into a small pot (it’s not necessary to sift the cocoa, as any lumps will be broken down in the processor). Heat over medium-low heat just until it begins to bubble around the edges of the pot, stirring frequently to prevent scorching. (While this step adds work, it’s essential to prevent the cocoa from having a starchy, powdery taste). Remove from heat and stir in the vanilla. Add the cocoa mixture to the processor and process until completely smooth and velvety, about 3 minutes, stopping occasionally to scrape down sides of bowl (you want to ensure that there are absolutely no little pieces of tofu visible). The mixture will seem too thin for pudding; this is as it should be. Pour the mixture into one large or several small glass serving bowls and refrigerate at least four hours, preferably overnight. It will firm up as it chills. This would also be a great filling for a chocolate cream pie. Store in refrigerator up to 4 days. Makes 4 normal servings, 2 servings in my house. Wow, that’s pretty devoted to soy! I love the idea of making it myself (you definitely know what’s in it, in that case), but I kind of cringe at the idea of yet another appliance in my house that I don’t actually have room for! Mmm. I’m going to try making this with stevia. Looks delish! Really excellent pudding recipe!!! Cooking the cocoa is essential. I added a pinch of exceptional sea salt and a tablespoon (or two) of espresso (or dark roast) coffee. Made a great recipe even greater. Thank you for such a delicious treat. This tofu pudding was downright delicious. I never thought tofu could taste so good! I made it last night, refrigerated it overnight, and today I’m going to make chocolate parfaits with some fresh berries. I had to get a little taste of it at breakfast today! I’ve made this more times than I can count & it’s always a huge hit. When raspberries are in season, I mash some in the bottom of a bowl, and spoon the pudding on top – YUMMY! It’s also delicious with Boyajian orange oil or natural almond extract added.